Taylor Serial Number Breakdown | DSL Inc.
A serial number is a unique, identifying number or group of numbers and letters assigned to an individual piece of hardware or software. The idea behind serial numbers is to identify a specific item, much like how a fingerprint identifies a specific person. 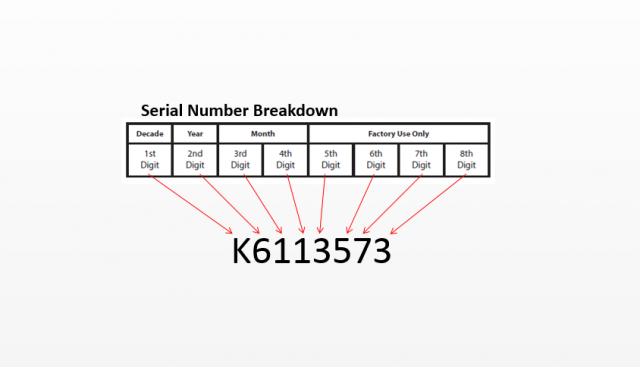 Instead of some names or numbers that specify a whole range of products, a serial number is intended to provide a unique number to one device at a time. This number is used to identify the build date of the unit. The 2nd Digit is the exact year. The 5th – 8th digits are for factory use. The above number signifies that the is equipment built in November, 2006.